San Miniato is a small town lying in the province of Pisa, Tuscany. In medieval times, San Miniato was on the famed Via Francigena, which was the main connecting route between northern Europe and Rome. As a result, San Miniato was regularly exposed to a constant flow of friendly and hostile armies, traders in all manner of goods and services, travelers from near and far and a flood of religious pilgrims making the pilgrimage to Rome. 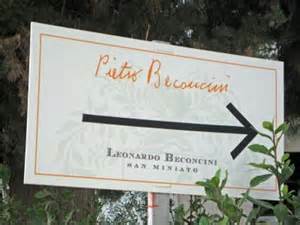 In the 1950’s Pietro Beconcini, grandfather of the current owner Leonardo, purchased the property that is now Agricola Pietro Beconcini with the aim of dedicating the land to local sharecropping. At the time, the farm was replete with grains, beans, grape vines, olive trees and forest. Pietro’s son eventually took control of the estate and dedicated his energies solely to producing wine. Leonardo Beconcini carries that passion with him today and has elevated the quality of the wines to heights never before seen from San Miniato. There is fascinating history here. Pietro Beconcini lays claim to being the only producer in Tuscany of Tempranillo. It is a claim steeped in centuries old lore. Of course, Tempranillo is the famous, primary red grape from Spain, responsible for the wordly reds from Ribuera del Duoro and Rioja. So how did it end up in this small corner of Tuscany? The ancient Via Francigena passes directly through what is now Pietro Beconcini’s wine estate, alongside the very vineyard that provides the Tempranillo for Beconcini’s wine. Religious pilgrims, on their way to Rome arrived from all over Europe, since the two main routes of the Via Francigena originated in Canterbury England and Santiago di Compostela in Spain. At the time, priests, in addition to their religious charges, were also responsible for overseeing agricultural undertakings. New vineyards were started in those days by planting grape seeds, primarily because over long journeys it was easier to carry a small container of seeds rather than an awkward, heavy bundle of vine cuttings. This fact strengthens the results of Beconcini’s DNA research, which indicates that a high percentage of tested genetic material is identical to Spanish Tempranillo, but with small obvious evolutionary differences expected in a vine that was started from a seed and not from a mature cutting. Today, these centuries old vines produce richly flavored berries that are treated with the utmost respect by Beconcini and crafted into two amazing wines, both of which are reviewed below. Perhaps the best part about tasting through this portfolio of wines was that I had absolutely no pre-conceived notions of what to expect. I was not familiar with the winery, or the wines. I had no idea what the wines cost before we tried them. The only information I had was given on the back labels of the bottle. Essentially, these were blind tastings. My notes below will make this point evident, but I’ll reinforce it here: these wines are excellent and you should start searching for them. Finally, the wines were tasted over a period of a few weeks and always with meals. The first wine tasted was the 2007 Reciso, a 100% Sangiovese. This is a deep black red color. Striking concentration. The vines that provide the fruit for this wine are in excess of 50 years old and come from a tiny portion of land on the Beconcini estate of only 3 hectares. The aromas are intense. Complex notes of cured meat and leather accent the ripe, dark fruits. Spice and dried flowers combine as well. On the palate, the wine is full bodied with intense flavors that follow the nose. Impressive Sangiovese concentration. Powerful, ripe and chewy, yet approachable. Loads of cherry and spicy fruit lead to a long finish. Authentic, precise and modern. Really great. 93 points. SRP ~ $40. 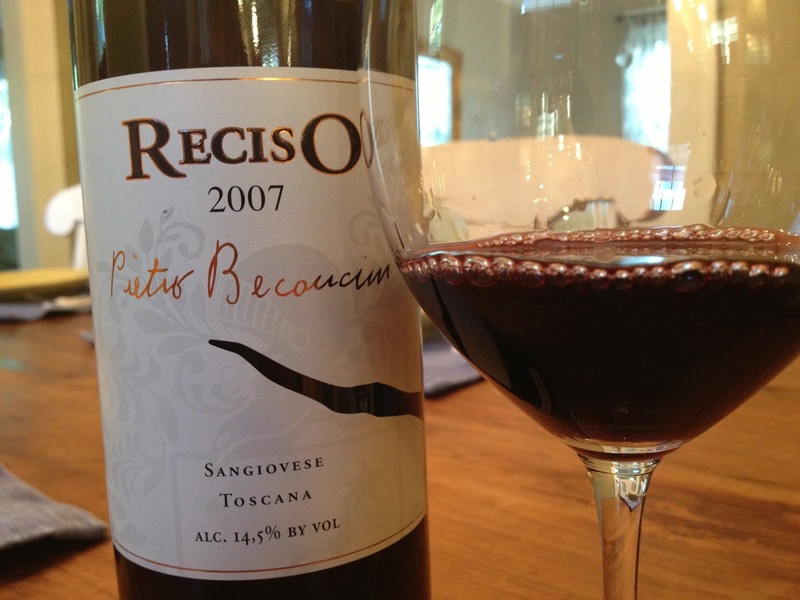 Reciso is Beconcini’s flagship Sangiovese and rightfully so. It’s fermented with native yeast in lined cement vats where it macerates for a full 5 weeks. Aging for 24 months is carried out in large Slavonian Botte and French Tonneaux. Further refinement in bottle of 12-18 months prior to release. Disclosure: This wine was an importer provided sample. For years prior to the DNA identification of what turned out to be Tempranillo on Beconcini’s estate, Leonardo was making wine from “Vine X” all the while, not knowing the true identify of the vines. This second wine takes it’s name from that time period and uses the ancient Tuscan pronunciation of the letter “X” – iXe. Using massal selections from the ancient vines in Vigna alle Nicchie, “new” Tempranillo vines were planted on the estate in 1997. These vines provide the fruit for iXe. 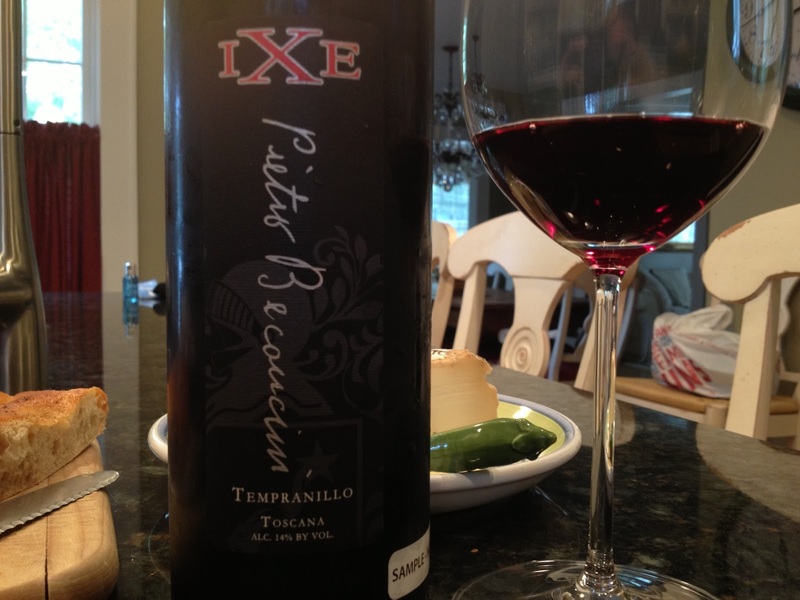 The 2009 IXE is predominantly Tempranillo but also contains a small unspecified portion of Sangiovese. Fermented and macerated in lined cement tanks, the wine spends about one year in second passage barrels that were previously used for it’s big brother, the Vigna alle Nicchie. It then bottle ages for an additional year. The wine is a medium ruby with violet reflections. There is a slightly funky note on the nose that adds more than it detracts. I can see where it may be offputting to some. On the palate there is a good core of tobacco, spice and cherry fruit that is bright and floral. This is very tasty, but clearly more of an early drinker. 87 points. SRP ~ $15 Disclosure: This wine was an importer provided sample. While not to sound cliche, this is precisely the traditional take on the wines of this estate. And the next wine bears this philosophy as it’s name. The 2010 Antiche Vie, or “Ancient Ways”, bears all the hallmarks of wines made yesteryear. Gone are the international varietals. Gone is the wood aging. This is stripped down Chianti in it’s purest form. And it’s a success. 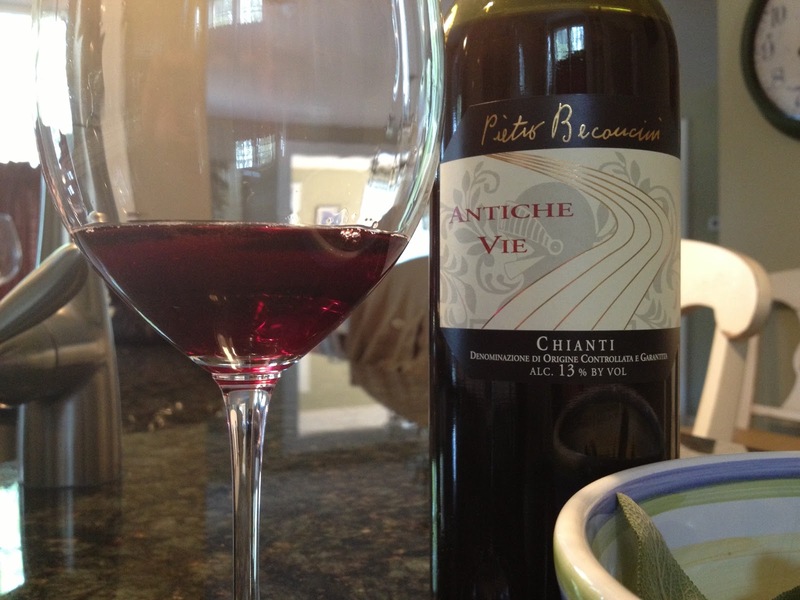 Antiche Vie is a blend of predominantly Sangiovese with Colorino, Canaiolo, and Malvasia in small proportions. Fermentation takes place in lined cement vats and then the wine is bottle aged for one year prior to release. What’s left is pure fruit; vibrant and juicy. This easy going light ruby wine has delicate floral, and berry aromas and flavors. It’s unadulterated in the mouth. Primary and delicious with a slight mineral note. Great with lighter fare: pasta marinara, pizza, or assorted antipasto. We enjoyed it alongside Ravioli with Sage Brown Butter. 87 points. SRP ~ $12 Disclosure: This bottle was an importer provided sample. 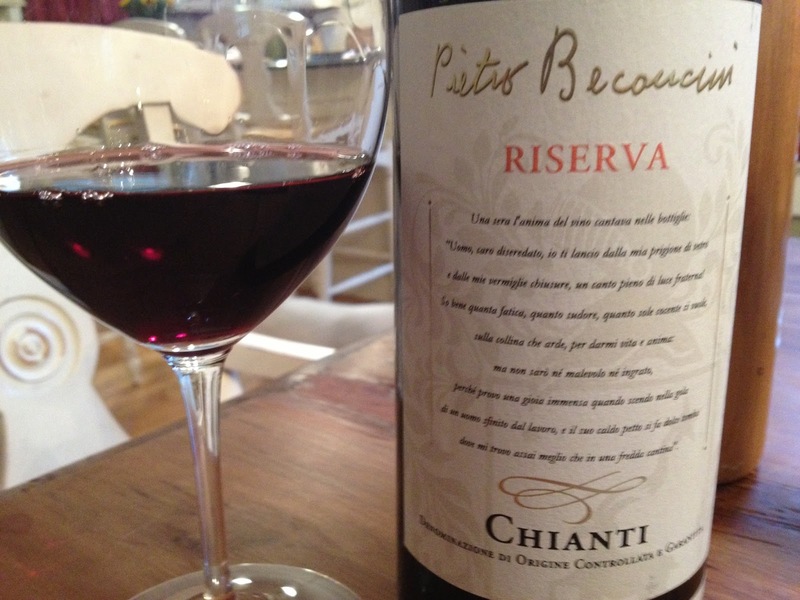 The tradition continues with Beconcini’s expressive Chianti Riserva. 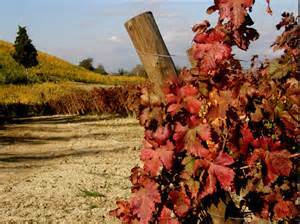 For over 100 years, fine Sangiovese has been grown in and around the region of San Miniato in Tuscany. Many of the growers are simply that; farmers who sell their grapes to some of the largest Florentine winemaking familes. “Leo” embraces the San Miniato area and is virtually alone in crafting wines from this corner of Tuscany, near Pisa. He hews to tradition with his Chianti Riserva. The 2009 Chianti Riserva is classically proportioned in all aspects. Blind, I’d suspect it would be a dead ringer for a fine Chianti Classico Riserva. It’s a blend of 80% Sangiovese and 20% Canaiolo that is fermented in glass lined cement vats with native yeasts. Maturing takes place in Slavonian Botte for one year and then the wine is held for up to 30 months in bottle before release. What is left is a gorgeous Chianti. Deep ruby colored, with a slight violet hue at the rim, the wine boasts aromas of fresh flowers, mushroom, fresh sage and crushed berries. On the palate the wine has impeccable balance between the fruit, acids, and tannins. Medium bodied, it’s approachable and adds a spicy component of flavor to the red fruits and tobacco notes that dominate. Delicious. 90 points. Disclosure: This wine was an importer provided sample. 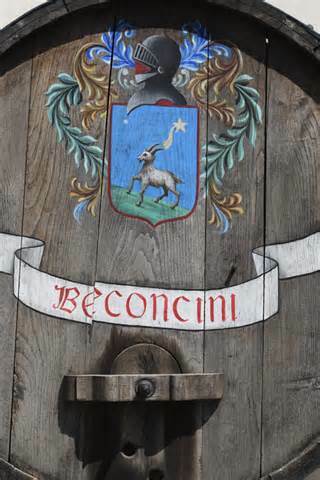 In 1993, a grouping of 213 vines, obviously very ancient, were discovered on Beconcini’s estate. While researching their origins, experimental wines made were jokingly referred to as “Grape X”. By 1997, with research still ongoing, massal selections were made from the budwood of the ancient “Grape X” vines and planted elsewhere on the estate. In February of 2004, the final results of the extensive DNA clonal research were completed and “Grape X” was revealed to be Tempranillo. The years leading up to this discovery were not wasted by Beconcini. Experimental and ambitious techniques were applied to “Grape X” in learning how best to create wine from this “unknown” varietal. With the 2004 vintage, Vigna alle Nicchie was born. Vigna alle Nicchie arises from the decade of research, both DNA, and viticultural that has led to this unique and outstanding wine. Nicchie, in the Tuscan dialect, is the name given to the bits of fossilized sea shells that are a prominent factor in the soil composition of the area and inparticular, Beconcini’s estate. In Leonardo’s own words: “During the years of the ongoing research, I finally made the decision to produce an ambitious Tempranillo, using even extreme procedures, such as partially drying the grapes before fermentation.” The results speak for themselves. The 2008 Vigna alle Nicchie is a dark, blackish red. Nearly impenetrable color. The aromas on the nose are absolutely massive. Huge expressive crushed red berry fruit, dusty clay notes, coffee, sweet pipe tobacco and spices combine harmoniously. On the palate the crushed red fruits are in massive proportion. Loads of dusty cherry, olives, a sense of salinity, tobacco and vanilla are complex and seamlessly woven. Amazing concentration of flavors and power given the vintage. Wow! 96 points. Vigna alle Nicchie is hand harvested in early September. The grapes are then brought to the drying loft on the estate where they are left until mid October. During this drying process the grapes typically lose almost 25% of their weight. Fermentation then begins and usually lasts up to 10 days and then the must is macerated for almost 6 weeks. Aging is carried out in a combination of French (70%) and American (30%) oak barrels and lasts up to 2 years. The wine then spends 2 years in bottle prior to release. SRP is approximately $50. Disclosure: This bottle was an importer provided sample. I had the distinct pleasure of chatting briefly with Leonardo, “Leo” Beconcini after I had tasted his wines. Leo, your wines seem to epitomize great respect for tradition. Indeed, you don’t see widespread use of cement vats in Tuscany. Yet, you use barrique for Vigna alle Nicchie with great skill. How do you explain these seemingly diverging methodologies? How did you feel when you initially discovered VINE X? How did it feel when you finally had the vines identified? Of course. So what is new at Beconcini? What gives you the greatest reason for excitement today? Are you frustrated by the relative lack of notoriety that the estate receives? We could expect much more attention for our long hard work that it has taken us to discover a Tuscan Tempranillo, perfectly adapted to our terroir by passing centuries. It would be nice to see more interest by the wine critics, and we thank you Giovanni for allowing us to help with this article! But we have learned with time that in the actual wine business we must spend a lot of money to obtain this attention. It’s not a coincidence that the most famous wines are the result of aggressive marketing and promotional actions, and powerful big wineries can afford do this. We are an artisanal family owned winery for many generations, and we will continue to explain our wines by travelling around the world and organizing tastings with our selected importers, who prefer to work with small wine realities like us. As they say, it’s a great value that what you taste when you drink our wines is that which our soul expresses. We put that front and center. Grazie Leo, and to Eva for the assistance! Molto grazie a lei Giovanni….Prego! If you are interested in locating the wines of Pietro Beconcini, please visit Presto Wine USA, Inc.
Can't hardly wait to find a bottle of Vigna alle Nicchie! Dennis, although not the one linked in this article, I do know for a fact that Pietro Beconcini has an importer in Boston, so I suspect you could find these wines with minimal effort. If you need the name, let me know. It escapes me at the moment, but I can look it up. Interesting wines and other to read about thank you, Where do you export your product at this time? Not sure if you're asking me or Leonardo. Beconcini wines are exported to the US. I'm not sure how wide the distribution is in Europe but I know they're available. Contact the US importer in the article above if you like. Otherwise, you can email me, and I'll get you in touch directly with the producer. I believe it is best to pass, you seem to cover your sales well. Good Luck. Ciao Eva! Thanks so much for commenting. I'm working with John at Presto to set up a few more things and garner some Nicchie & Reciso for myself. Two of the best kept secrets in Tuscany, but hopefully not for long. Hope to see you soon. Let me know if you come tot New York or New Jersey. soon Vigna alle Nicchie & Reciso In Miami, FL! Good luck Federica! Great people and excellent wines. 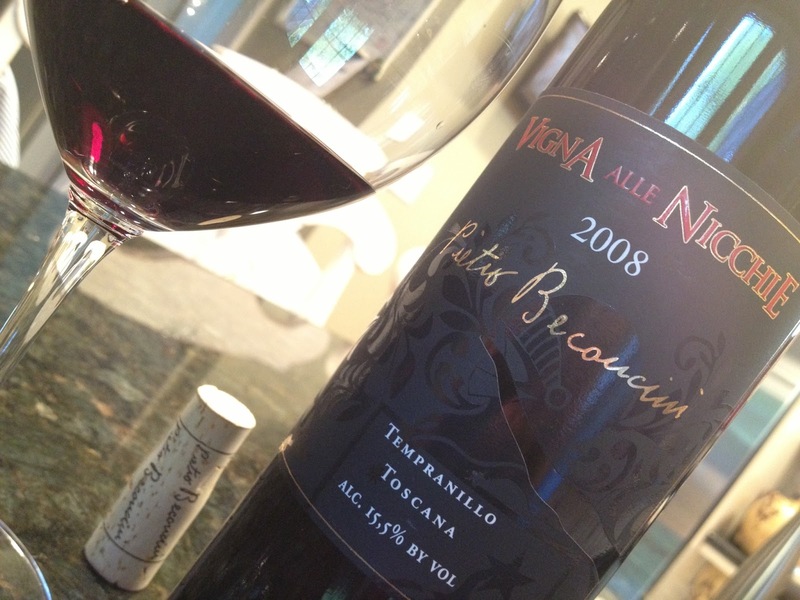 The Tempranillo are special, but don't make the mistake of overlooking the Reciso. Quite an amazing Sangiovese. Leonardo Beconcini , we related ? I have been trying to trace my heritage. My great grandfather was Sabatino Beconcini and he came to California leaving from the port of Lucca in the early 1900,s, with his two sons, Joseph and Domenico. I believe Sabatino came to this country because they were sharecroppers in the Tuscan region ,with hope for a better future in California. I am hoping to have found my family link to Italy, please let me know if this sounds possible. Ellen, I will reach out to both Eva and Leonardo and maybe they will contact you. Cheers.